I came across a report sponsored by the medical journal “The Lancet” and the University College of London entitled “ Managing the health effects of climate change.” There are pictures of glaciers, volcanos, floods, and many dazzling graphs. The most stunning is a distorted and bulging earth (Patz et al., 2007). On top it shows the total undepleted CO2 put into the air from 1950-2000. The larger a region on the map, the more CO2 a region puts into the air. 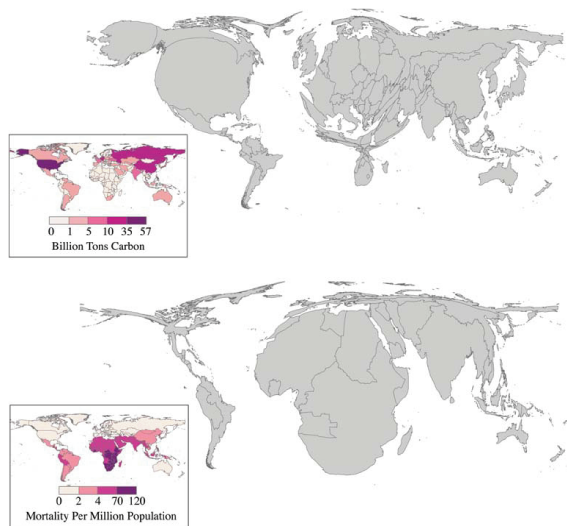 On the bottom, it shows how many people will likely die as a result of calamities that are larger in a warming climate for the 2000-2030 period. The larger the region on the map, the more people will be wiped out. Enjoying a high standard of living fueled by burning coal, oil, and gas, we Europeans and North-Americans use energy to keep our computers, cars, and industries running. In the process we released about 10-30 pounds of CO2 per person per day averaged of the last 50 years. We are immune to malaria, a disease fostered by warmer climates; we got a strong economy to feed and cloth us so we do not starve; and except for the poor of New Orleans who drowned in hurricane Katrina, we rarely die of floods. The situation is different in Africa and Asia. The average CO2 released is well below 2 pounds per person per day. There just are not as many computers, cars, and industries there. Instead, malaria is the main killer as it reproduces fast. Rising sea levels caused by a warming climate will cause more flooding of poorly protected areas where more poor people will drown. No single flood, malaria, or drought will ever be caused by global warming alone. Global warming is an abstract and statistical concept that varies by region and over time. It is always present and poses an ethical dilemma: those with computers cause most of the global warming, but we do not pay the full price, while those without computers who contribute the least to the warming, they will pay more than full price. Hardly seems fair, but such is life … and we need our computers. This entry was posted in Global Warming and tagged Africa, climate change, energy, health, malaria. Bookmark the permalink.